Colorado Springs wildfire: new technologies to combat forrest fires. We’re in for More Wildfires Than Ever. These New Technologies Will Help Fight Them. Smoke from the Waldo Canyon fire drapes the foothills in Colorado Springs. 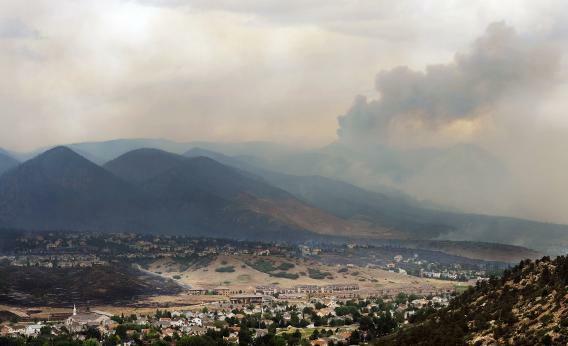 More than 1,000 firefighters are trying to fight the Waldo Canyon wildfire that has scorched Colorado Springs, which has displaced 32,000 residents. Yesterday, the Colorado Springs mayor said that the wildfire is the most destructive in the state’s history. And that’s just one of six raging in Colorado this week. Colorado and other Western states are also suffering massive heat waves and gripping drought, and according to the U.S. government, much of America may soon be in the same boat—at least if carbon emissions continue at the current rate. The good news: The way we fight fires is changing thanks to technological progress in everything from data collection and computing to chemical engineering. Understanding the “fuel” content of forests, and the quickly changing weather in any given region, can be crucial for the firefighters and smokejumpers who parachute in to fight wildfires. So can catching fires early. In both Canada and the United States, thermal imaging technology helps both to spot fires and to establish boundaries. Computer systems can predict the probability and location of fires using current weather information, determine the rate at which it might burn with the help of biomass and moisture information taken from the forest floor, and even identify locations for likely lightning strikes—one of the natural causes of wildfires. Ottmar and others are building a national database of this kind of information and mapping it. Photos on the map are coupled with detailed data points on the amount and kinds of live and dead vegetation in a given area, which helps teams like those now fighting the 87,000-acre High Park fire in northern Colorado choose their methods of containment. With advances in high-resolution mapping driven by competition among tech companies, it’s reasonable to assume these methods will improve. Despite now being 85 percent contained, the High Park fire has already cost some $36 million to fight. For a fire that size to actually go out, it will require what foresters call an “act of nature,” like prolonged snow or rain—two things fairly scarce during the summer in a state famous for its sunshine. We’re getting closer to being able to create our own acts of nature. Modern water bombers like the CL-215 drop 1400 gallons of water at a time on fires. Other newer types of retardants, which can contain ammonium salts for suffocating fire, and foam—a fire suppressant similar to dish soap that absorbs heat and slowly releases water into the surrounding wood fuels—are improving our wildfire containment and control abilities as well. No matter how our data synthesizing and water-bombing abilities improve, we won’t be able to beat the best method: a good old-fashioned rainstorm. But we’re working on that method, too. Last year, the United Arab Emirates spent $11 million on land bound ionizers that reportedly created rainclouds. Someday soon, we might try to deploy similar drought-relief methods to fight wildfires.